IT HAS long been blamed for creating a nation of couch potatoes. But a new report today claims that Britain's love affair with television is causing far more damage - both physically and psychologically - than previously thought. The findings have been compiled by Dr Aric Sigman, a psychologist who has previously written about the effects of television on the viewer. His report, analysing 35 different scientific studies carried out into television and its effect on the viewer, has identified 15 negative effects he claims can be blamed on watching television. Among the most disturbing findings are the links he claims to have found between long hours of television viewing and cancer, autism and Alzheimer's. The effects on children watching TV have been well publicised in Britain. Fears of a timebomb of obesity have sparked a wave of ministerial initiatives to promote sport and tackle the couch-potato lifestyle. However, today's report suggests the consequences of television are far more serious. They range from myopia and attention deficit disorder to diabetes, autism, Alzheimer's and a generation whose brains are being numbed by on-screen imagery. His report, published in the respected Biologist magazine, claims the problem with television lies in the length of time we spend in front of the set. For most people, watching television now takes up more time than any other single activity except work and sleep. According to the British Audience Research Bureau, by the age of 75 the average Briton will have spent more than 12 years of their life watching television. Dr Sigman, an associate fellow of the British Psychological Society and author of Remotely Controlled: How Television Is Damaging Our Lives, said arguments over how educational programmes are were a distraction. He said: "The medical studies I have looked at are about the medium of television, irrespective of the programmes children are watching. It is the number of hours and the age at which they start which produces the biological effects. It is because of the medium, not the message, that these effects are occurring." Dr Sigman's research draws from studies by groups including the American Academy of Paediatrics, Cornell University, Stanford University Medical Centre, the British Market Research Bureau and medical publications such as the Lancet and the Journal of Sleep Research. The stage for the harm Dr Sigman believes television is doing is being set, he claims, by the vast amounts of it we watch - by the age of six, a child will already have spent one year in front of the television. When time in front of a computer is added, the psychologist claims watching a screen of some kind is the dominant activity for older children - those aged 11 to 15 now spend 55 per cent of their waking lives, or seven and a half hours a day, watching television and computers. According to today's report, that represents a 40 per cent rise in a decade. Dr Sigman claims the battery of ill effects takes its toll on both body and mind. He claims the effect on the brain is not stimulating, but almost narcotic, numbing the areas of the brain stimulated by, for example, reading. The influence of modern editing techniques - for example the rapid "jump cuts" - also plays its part. Attention spans fracture while at the same time, according to Dr Sigman, the brain is programmed to reward itself with the neurotransmitter dopamine for being able to cope with an onslaught of novelty on screen. The litany of bodily ills Dr Sigman links to television makes for equally bleak reading. He associates it not only with obesity, but Alzheimer's, diabetes and even the breakdown of cells capable of healing wounds. Dr Sigman claims a significant body of research now points to television as a key factor in reducing levels of the hormone melatonin, the substance that regulates the body's internal clock and also governs the speed at which puberty develops. Melatonin is produced at night and induces feelings of sleepiness. However, today's report suggests the bright light emitted by television screens may play a part in suppressing melatonin levels in the blood. That syndrome may explain that adolescents who are glued to the television are tired out by more than watching late-night programmes. The other crucial issue thrown up by melatonin, Dr Sigman says, is its link to puberty. The hormone also plays a key role in governing the onset of puberty, and its suppression may be paving the way for a generation of children to experience ever-earlier entries into adolescence. That tendency can be traced back to the 1950s, according to the report, when television itself became a mass medium. While the mass of research indexed by Dr Sigman goes heavily into physiology and biology, one conclusion may be more recognisable to general critics of TV - the suggestion that daytime TV and soaps virtually rot the brain. "The content of television - soap operas and talk shows - is also associated with poorer cognition in older women, including clinically significant cognitive impairment in attention, memory and psychomotor speed [reaction time]," he said. Dr Sigman last night said the youngest children should be banned from watching TV at all, and introduced to it "judiciously" after that. He added: "To allow children to continue to watch this much screen media is an abdication of parental responsibility - truly hands-off parenting." In a reference to the crusade by celebrity TV chef Jamie Oliver, the academic added: "While society has shown alarm over school dinners, it has ignored the high-screen diet children have been consuming." However, other critics last night suggested that not all time spent before a screen was bad. Adrian Monck, a professor of journalism and media analyst at City University in London, said: "I certainly think the idea of banning young children from watching television is impractical. "Television is part of growing up and what we need to be aware of is how children use that. Television, like everything, is something you have to take with a pinch of salt - I certainly think there is a good case for parents not using it as a substitute carer." Pat Kane, a broadcaster and writer, said he also disagreed with "parking children in front of television or DVDs without some element of monitoring or even participation in the narrative". However, Mr Kane cited programmes such as CBBC's Tracy Beaker - which is based on Jacqueline Wilson's novel about child in care - as a "fabulous" way of showing that "some children are facing problems with parents, lifestyle and economics". TELEVISION viewing is directly related to and now considered an independent cause of obesity. Sitting in front of a screen commands an increasingly large part of children's lives and, Dr Sigman believes, has replaced physical activity for many. Inactivity can also overlap with poor diet. TELEVISION may be involved in alterations in the activity, size and consistency of skin immune cells. It may lead to an increase in the migration of "cutaneous immune system mast cells", parts of body tissue that play a key role in healing wounds and offering defence against disease. TELEVISION can set the conditions for long-term cardiovascular illness, some research claims. The adult risk of raised cholesterol and the potential for heart disease is strongly linked to TV viewing habits formed in childhood and teenage years, setting up a store of problems for later life. A SIGNIFICANT relationship was found in which the metabolic rate decreased as average weekly hours of television viewing increased. Lowered metabolism leads to a reduced ability to burn fat. Combined with high-calorie food and drinks, it sets the stage for obesity and other health issues. PERMANENT eyesight damage previously attributed to genetics is now being strongly linked to television-screen exposure. 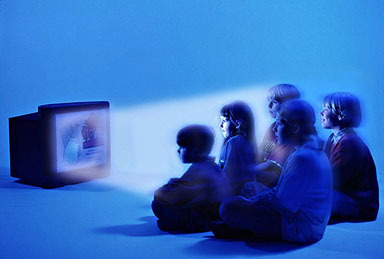 TV screens, or indeed computer screens, are blamed for a rising incidence of myopia as they demand long periods of fixed attention from the viewer. TELEVISION viewing between ages 20 to 60 is associated with the development of Alzheimer's disease: for each additional daily hour of television viewing, the associated risk of Alzheimer's disease development increases. Attention, memory and reaction time may also be affected. LONG periods of TV viewing may affect what are called the "neuronal mechanisms" behind attention and impulse control. This means damaging brain-cell development and the person's ability to concentrate on non-TV subjects. For children this could mean learning difficulties and attention disorders. WATCHING television suppresses production of melatonin, a key hormone and powerful antioxidant that has important roles in the immune system, sleep/wake cycle and the onset of puberty. Melatonin regulates the body's internal clock but bright screens may interrupt production. REDUCED levels of melatonin may also result, Dr Sigman suggests, in a greater chance that cell DNA will produce cancer-causing mutations. Some doctors have speculated on a link between sleeplessness and cancer, which one expert suggested formed a "pathway from stress to disease". EXPOSURE to TV screens affects the melatonin levels of younger children, in particular at the onset of puberty. Girls are reaching puberty much earlier than in the 1950s, a fact critics of TV put down to reduced levels of melatonin. Animal studies link low melatonin levels to early puberty. EARLY childhood television viewing may be an important factor in autism, which currently affects one in every 166 children. Dr Sigman quotes Cornell University, which last year published research suggesting television may be a trigger in young children with a tendency to the condition. A SIGNIFICANT relationship was found between exposure to television and sleeping difficulties in different age groups ranging from infants to adults. Television viewing among infants and young children is independently associated with irregular sleep schedules. THE lack of sleep ascribed to the effects of watching TV may directly increase appetite and body-fat production. Research suggests it could do this through alterations in the hormones leptin and ghrelin, which regulate feelings of being full and of hunger respectively. EVEN interactive media such as computer games have been associated with limited neurological activity. Watching television has been found by neuroscientists to be a "non-intellectually stimulating activity" for brain development. This was not found to be the case for reading. DR SIGMAN'S report suggests TV viewing is directly related to and significantly raises the risk of abnormal glucose metabolism and new Type-two diabetes. This is linked to side-effects of a sedentary lifestyle and the kind of diet that can go with heavy TV watching, such as sweets and sugary drinks. MELATONIN is a hormone produced by the pineal gland in the brain and plays a key role in regulating the body's internal clock. The body manufactures it at night and rising levels of melatonin in the blood have the effect of inducing sleep. One possibility is that the bright light given off by a television set suppresses the release of melatonin. If true, this action would suggest TV has a role in disrupting the sleep/wake cycle beyond the viewer merely staying up late to watch a particular programme. Television's suppressive effect on melatonin in the human body is also believed by some researchers to explain ever-earlier instances of puberty in the western world. Since the 1950s, puberty has been spotted at increasingly early ages, a syndrome some claim stems from the arrival of TV. SAOIRSE Woolley has bucked the trend for children to spend hours glued to a TV screen. She admitted she enjoys CBBC but said she'd rather be outside than watching television and doesn't even want a TV in her bedroom. The bright and articulate ten-year-old, visiting Dynamic Earth in Edinburgh with father Chris, said: "I don't really watch TV that often. I like to read and I like to go out and do things." Mr Woolley, 54, a jeweller from North Berwick, said he was surprised by the findings - particularly the statistics on how long the average child spends in front of the TV. Kenny Notman said his two daughters' viewing time was rationed because it took time away from family activities. The 42-year-old human resources manager from Edinburgh said he and his wife both worked, so family time was precious. But he said he had no objection to Hayley, 13, and Anna, five, having a TV in their bedrooms. He added: "It's not the TV itself which is the problem, it's the parents who allow their children to watch too much of it." And Anna added: "I do like the Tweenies, but I'd rather go out and play." Social worker and mother-of-three Dawn Cameron said that there was an element of "scaremongering" over the TV health warnings. She added: "It can also be relaxation and there seems to be a lot of emphasis on everything having to be educational these days. TV takes the blame for a lot of problems which may be related to poverty and other issues."